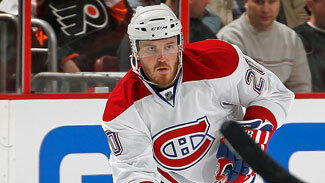 COLUMBUS, OHIO – The Columbus Blue Jackets have acquired the rights to defenseman James Wisniewski from the Montreal Canadiens in exchange for a seventh round pick in the 2012 National Hockey League Entry Draft, club Executive Vice President of Hockey Operations and General Manager Scott Howson announced June 29. The seventh round pick will become a fifth round selection in 2012 if Columbus signs Wisniewski (pronounced wihz-NOO-skee) prior to the 2011-12 season. Wisniewski, 27, has registered 27 goals and 121 assists for 148 points with 302 penalty minutes and a +5 plus/minus rating in 329 career NHL games with the Canadiens, New York Islanders, Anaheim Ducks and Chicago Blackhawks. Last year, he combined for 10-41-51 and 38 penalty minutes in 75 games with the Islanders and Canadiens, including 7-23-30 and 20 penalty minutes in 43 games with Montreal. The Canton, Michigan native was Chicago's fifth pick, 156th overall, in the 2002 Entry Draft and made his NHL debut with the Blackhawks during the 2005-06 season. He was a Canadian Major Junior All-Star during his four seasons with the Ontario Hockey League’s Plymouth Whalers from 2000-04.